When I’ve visited more countries than I have states I know it’s time to start exploring my own backyard in the good ‘ol U.S of A. Growing up in the West and having been to most neighboring states has made me particularly interested in exploring more of the Eastern states. 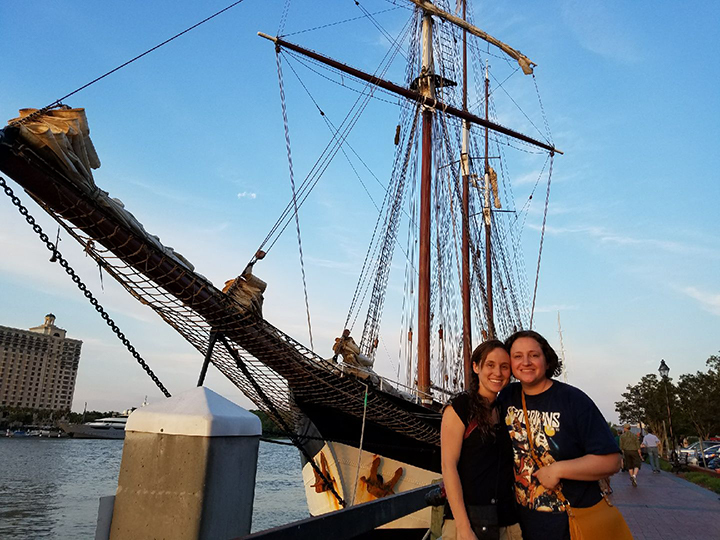 With my second oldest sister and her family living in Savannah, Georgia it was more than reason enough for me to visit. 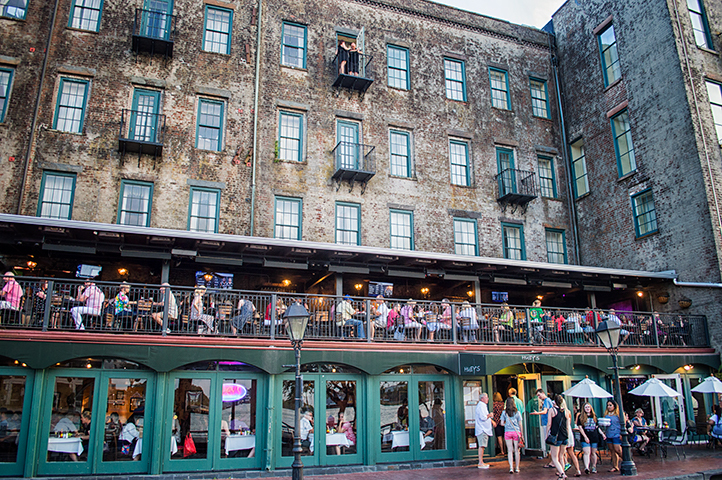 A popular attraction in Savannah is to walk the River Street and have dinner at one of the many Restaurants right off the walk. You’ll find mouth watering Southern cooking with an amazing view of the Savannah River. There’s also plenty of shops around to find a fun souvenir- I couldn’t resist buying one of the characteristic voodoo dolls for a gag gift. Also, make sure to save room for dessert! I suggest stopping at River Street Sweets for taffy making, and Huey’s for fluffy beignets! Afterwards, walk by the river listening to the musicians and watch the ferries cruise by. 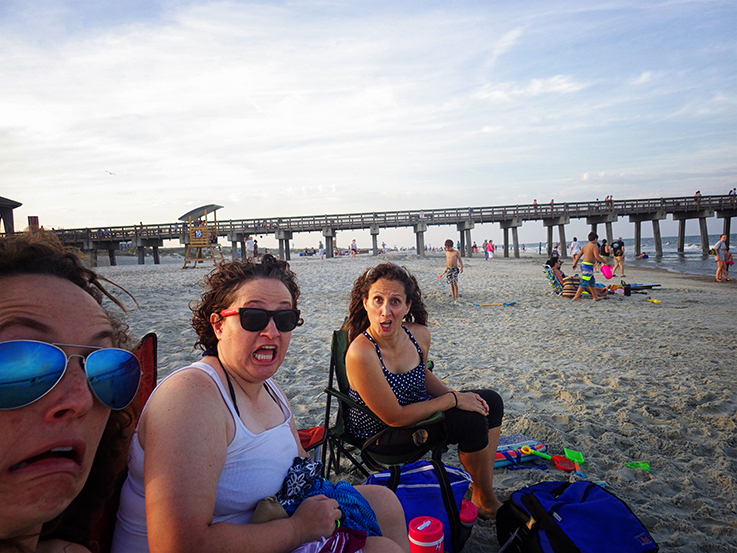 On one of the many sunny days in Savannah, all 8 of us packed into my sisters suburban and headed out to Tybee Island for a beach day. When we arrived artists were making animal shaped sand sculptures and the beach was crowded with people. 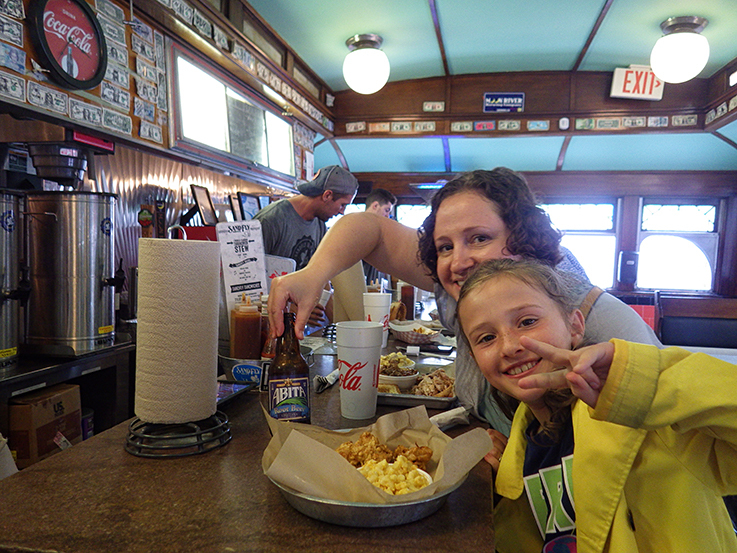 We had lunch at a nearby diner called Frannie’s where I had a po’ boy sandwich and we played on the beach afterwards. Truthfully I wish I could be a history buff like my dad, but I have the memory of a goldfish. 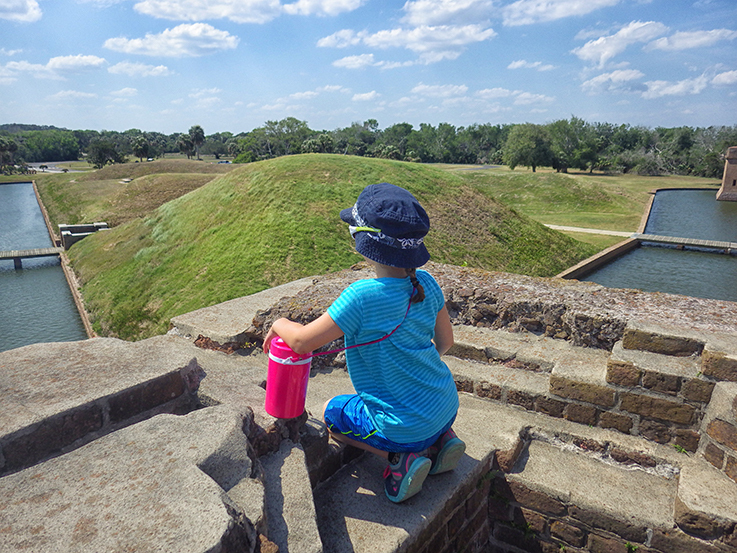 While we were on Cockspur Island visiting Fort Pulaski I did manage to retain the interesting history of what happened at Fort Pulaski during the Civil War. Although believed to be impenetrable – the new rifled cannons began to break through the brick walls and coming ever closer to the main powder magazine. To avoid the inevitable explosion to end all of them Fort Pulaski was surrendered by General Olmstead to the Union. It’s such a better way to learn about our country’s history by visiting places where such monumental events have taken place. History buffs would love it and even people who aren’t as interested (guilty) can enjoy it. 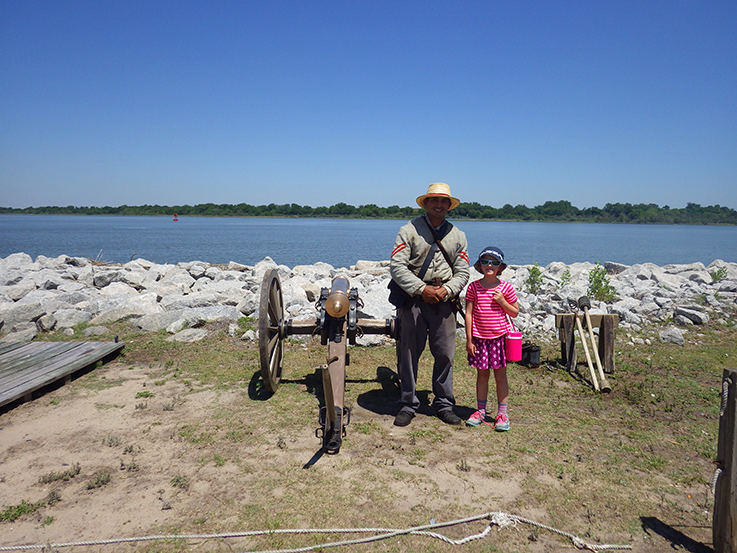 Me, my parents, my sister and niece went to Fort Jackson to watch the cannon fire. A soldier dressed in civil war clothes (yikes, too hot!) demonstrated the use of cannons and different artillery. My niece was such a trooper during his hour long spill! She started to melt onto the cannon next to me as he finished his last words. How on earth did the soldiers do with all the heat and standing out long hours of the day in there long and thick clothing?! What’s so special about the Davenport House? My thoughts exactly when my sister excitedly told me she had tickets for a tour. Isaiah Davenport created a house with unique architecture and it had a monumental affect on the preservation of Savannah. (Another great reason to read Midnight in the Garden of Good and Evil as it talks about the reconstructing of Savannah). 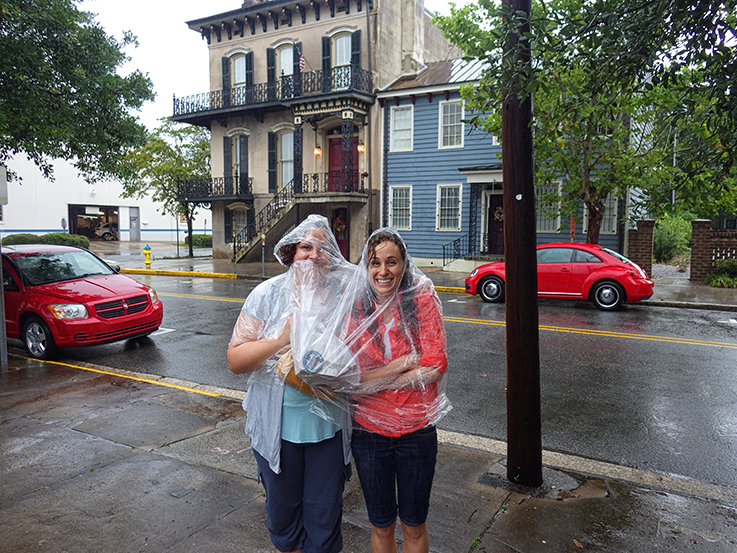 I’d recommend doing a tour, and perfect for a rainy day – which is exactly when we did it. Me, my oldest sister and niece decided to take a drive to South Carolina to visit Hilton Head Island. It’s a nice drive that only took us an hour. 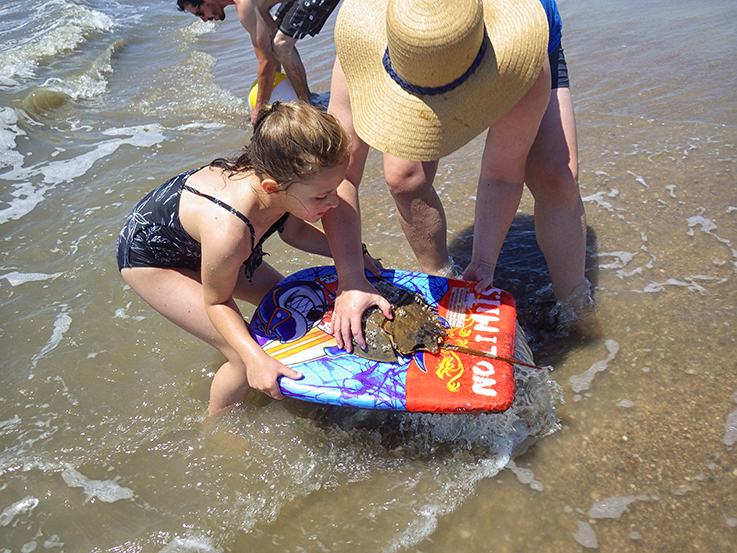 We spent most the time on the Driessen Beach boogie boarding and collecting seashells. We even found a mysterious creature! 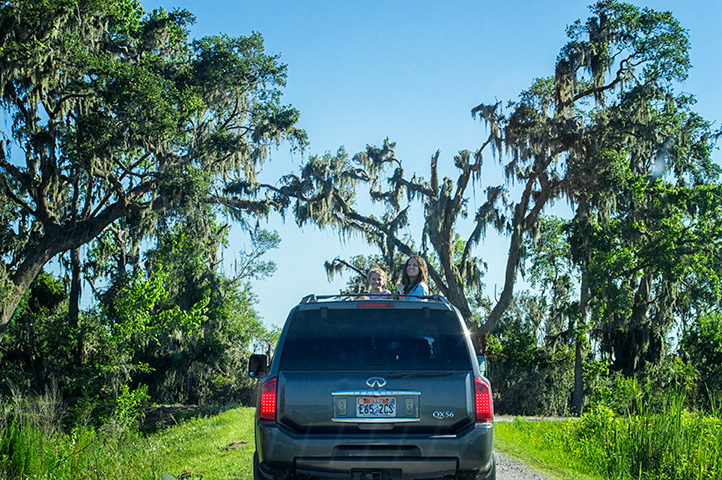 At the Savannah National Wildlife Refuge we all went out searching for gators. We drove through the Refuge, stopping when we saw a gator and getting out when it was safe enough. It was a unique and fun thing to do with the family, and the drive through the Spanish Moss covered oak trees was so cool! Ever since my flight from Atlanta people in Georgia had told me about the book, Midnight in the Garden of Good and Evil. I eventually read it after my trip, a book that portrays some of the diverse characters of Savannah. 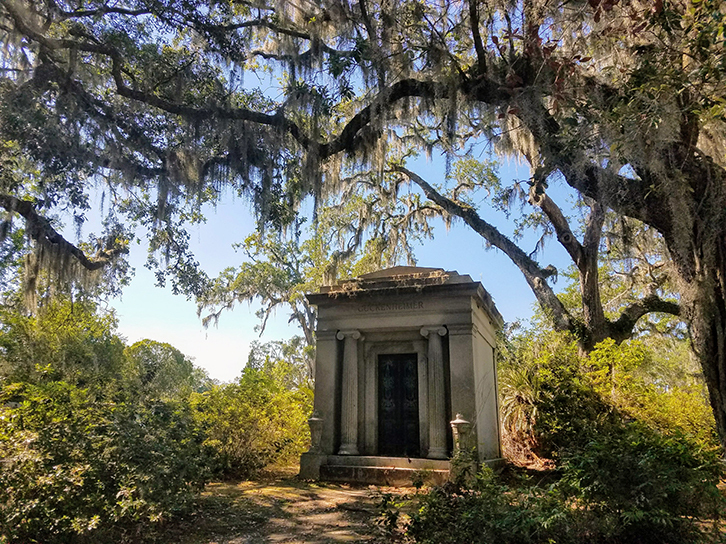 The Bonaventure Cemetery is one of the many places that is mentioned in the book and it’s the second coolest cemetery I’ve seen (the coolest was from our trip in Scotland). A lot of us in the family are big into Halloween and all things related, such as ghost tours. Since Savannah has a lot of Civil War history, there’s a lot of hauntings and therefore a lot of tours. I had a hard time figuring out which tour would be the best, but ended up booking a deal with Savannah Walks on Groupon. I thought the tour was fun, entertaining and creepy all in one so worth the money. We walked around at dusk, the chimney swift birds flashed past us eating the mosquitoes. We were told stories about a home that no one can live in because every previous owner came to their deathly demise. There’s also the home that is now rented to brave/foolish tourists who dare to spend a night being haunted. There was so much history to Savannah, and as a result endless stories. 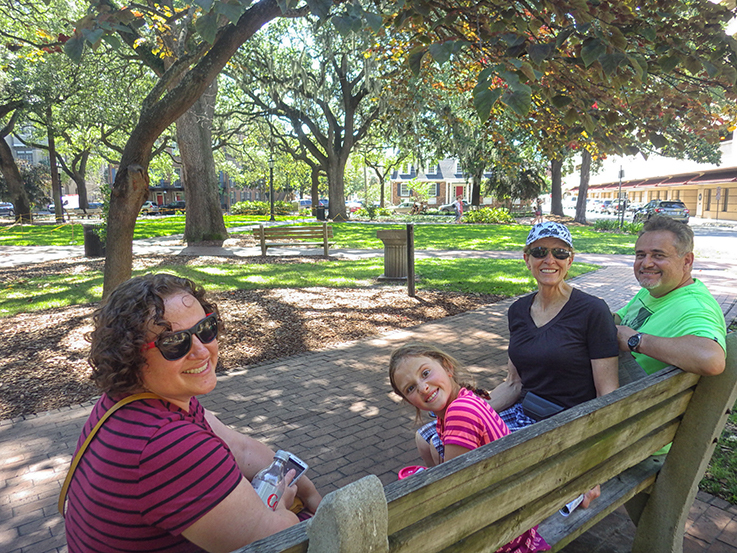 There are several squares in the Historic District in Savannah; Chippewa Square, Ellis Square, Reynolds Square, Oglethorpe Square, Johnson Square, Monterey Square, Wright Square, Telfair Square… Just to name a few! It’s such a laid back atmosphere in the squares, people walking their dogs off leash, carriage rides strolling through, old people sitting on benches. It seemed like a movie set! Aha, Forrest Gump I see why you sat there so long! On a rainy day during our stay we walked through a few of the squares and over to the beautiful Forsyth park. There was a wedding in the Park, which I imagine happens on the daily. We stopped in at an antique store, but had to leave shortly after. The store clerk gave us several stink eyes and kept pestering the kids to not touch anything. How about that Southern food! Walking around as a tourist always makes one hungry. After touring the squares we stopped at the Streamliner (Sandfly BBQ), an old train cart diner. I love old fashioned and odd places to eat, and this one fit the bill. Make sure you check in at Leopold’s for it’s famous ice cream (the sandwiches, burgers and fries are noteworthy as well)! Don’t you even think about skipping out on trying the Beignets! 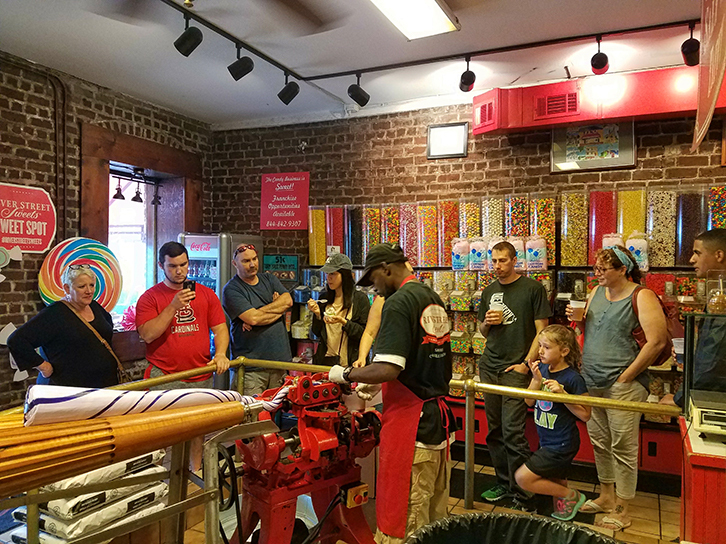 You’ll certainly be able to find some on the River Street along with some samples of their salt water taffy. Me and the fam went out to eat at Fatz and they had delicious Southern food. I’m not usually inclined to a franchise restaurant, but I still recommend it before you go to your comfortable Subway or McDonald’s. 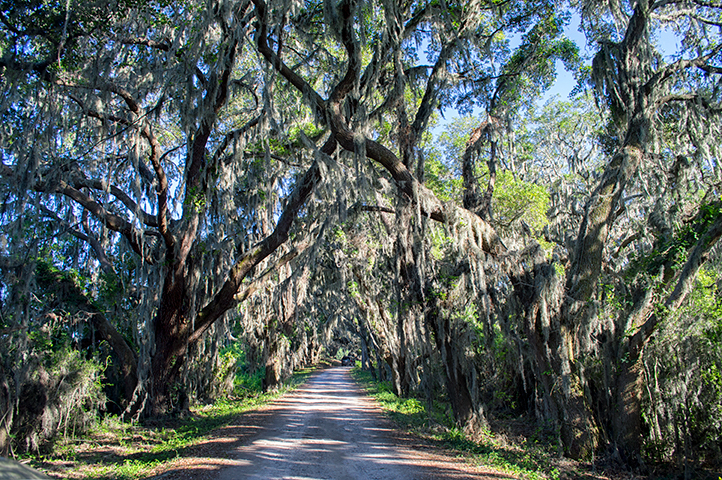 Wormsloe is a State owned historic site, which used to be the plantation of colonial founder, Noble Jones. The site has demonstrations of what colonial life was like and preserved original structures. My favorite of the structures was the one Jones had used a mixture of oyster shells and lime for the concrete! We drove under the tunnel of Spanish Moss covered Oak Trees to the plantation and walked around. The humidity was greater there because most of the plantation was covered in trees, trapping the heat and bugs in. 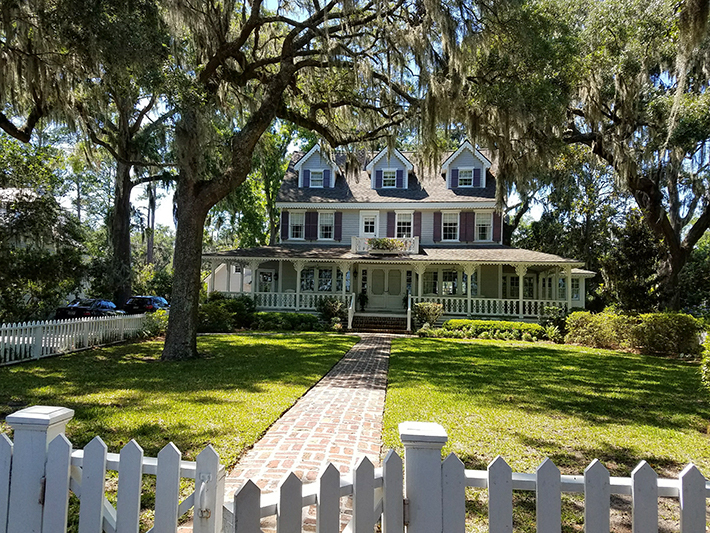 For any of you who’ve seen the movie The Last Song, by Nicholas Sparks, you’d recognize one of the Wormsloe Plantation houses from the movie. The Isle of Hope was built as a getaway for the rich in the 1800’s. They wanted to escape the Summer months and threat of Malaria. It’s since developed into an even fancier neighborhood for those who can afford to live there. The Victorian and neoclassical homes were jaw dropping. It felt like we were on a tour looking at all of them. Of course the million dollar homes were complete with a personal dock and yacht parked out front. 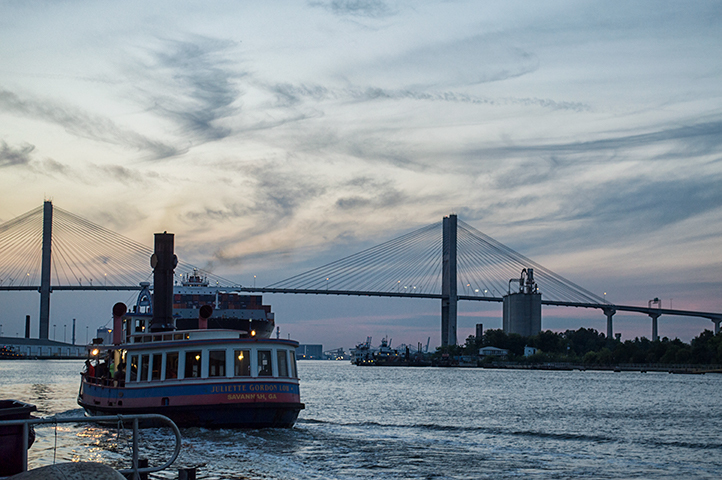 What is it you would find charming about Savannah? Next story Do you know Lithuania?